The old fashioned candy apple recipes below always bring back fond memories of childhood. 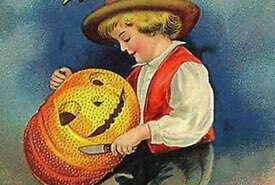 Our neighbor Mr. Watkins often made red candy apples on Halloween, and I can remember eagerly awaiting them all year long. There's nothing like biting into a delicious taffy apple that's been homemade. They're so good tasting! Why not get your entire family involved in making their own Halloween treats? It's loads of affordable fun. This vintage candy apple recipe makes a red and shiny candied apple similar to the ones you get at the fall fairs. Two cups granulated sugar, one-half cup light corn syrup, one-quarter cup water, red food coloring, one-half teaspoon cinnamon flavoring, twelve red apples, twelve wooden skewers. Cook the granulated sugar, corn syrup, and water in a small saucepan, stirring until the sugar is dissolved. Continue cooking without stirring until the syrup is brittle when tested in cold water. During the cooking, any sugar crystals thrown on the sides of the pan should be carefully washed down with a wet cloth. Remove the syrup from the heat and set at once over hot water. Add coloring and flavoring and mix well. Insert the skewers, which can be purchased from the butcher, in the blossom end of the apples. Hold each apple by the skewer and plunge into the hot syrup. Draw it out quickly and twirl it until the syrup is spread smoothly over the apple. Place apples with the skewer end down in a wire cake rack, which has been placed over a large bowl, so that the apple does not touch anything while hardening. These apples should be made the day they will be used. First prepare the apples for candy coating by washing them and removing the stems. Take a skewer and stab it right into the middle of the apple at its blossom end, and repeat for each apple. Be careful not to poke the skewer through the other side of the apple though. If wooden skewers are unavailable, a Popsicle stick with one end sharpened can be used in a pinch. In a small or medium sized saucepan set on medium heat, combine sugar, corn syrup, cinnamon candies, and water. Stir and keep stirring until everything is dissolved. Then stir some more just to make sure it's all dissolved. Once everything is dissolved, add cinnamon, vanilla, cloves, and food coloring to the mix. Now boil mixture to 300°F on the candy thermometer, or until the syrup is slightly brittle when tested in cold water. Remove from heat and quickly dip your apples into your candy coating and be sure to coat them well. Slowly twirling the apple will help spread the syrup over the apple. Place them with the skewer pointing up on waxed paper or a greased cookie sheet and allow them to harden. They will be quite hot for a while so make sure you let them cool completely to room temperature before eating! Try this candied apple recipe today. To make this candy apple recipe, first lightly grease 2 or 3 cookie sheets. Insert craft sticks into whole, stemmed apples. 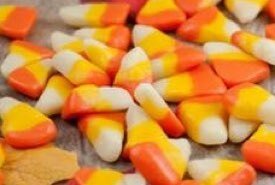 In a medium saucepan over medium-high heat, combine sugar, corn syrup, and water. Heat to 300 to 310°F (149 to 154°C), or until a small amount of syrup dropped into cold water forms hard, brittle threads. Remove from heat and stir in food coloring. Holding an apple by its stick, dip in syrup and remove and turn to coat evenly. Place on prepared sheets to harden. In our modern-day kitchens, we can also melt the chocolate chips in a microwave-safe bowl. This is easiest if you microwave for 30-40 seconds on LOW power, stir, and repeat until you have a bowl of smooth, creamy, melted chocolate. Watch the chocolate carefully, though, to prevent burning. Insert wooden candy apple sticks or skewers 3/4 of the way into the stem end of each apple. Combine caramels and water in a saucepan over low to medium heat. Stir often to get a smooth caramel mixture. Dip apples into hot caramel and carefully twirl to produce an even coating. Place caramel-coated apples standing up on a sheet of foil or a cookie sheet for easy decorating and cooling. Sprinkle evenly with the coarse salt and place in the fridge. Melt chocolate chips in a small pot over boiling water while stirring until the melted chocolate is smooth and creamy. Randomly drizzle melted chocolate over the apples. Sprinkle with the extra chocolate chips. Return to refrigerator to cool until ready to serve and eat. This homemade caramel apple recipe offers a new twist on the traditional candy apple recipe, and the results taste sensational. The gourmet caramel apple recipe is bound to become a Halloween favorite. You'll love the sensational sweet and salty taste of the chewy caramel taffy combined with the freshness of the Granny Smith apple. Absolutely delicious! 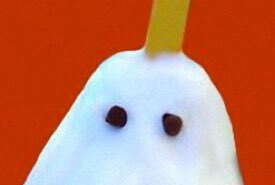 When I went out trick-or-treating as a youngster, the houses that gave out homemade candy apples always had the longest lineups of kids. One year, we altered our costumes a bit and got back in line hoping to get another one. Sneaky, eh? Unfortunately for us, when we had gotten to the door, there were no more apples left! 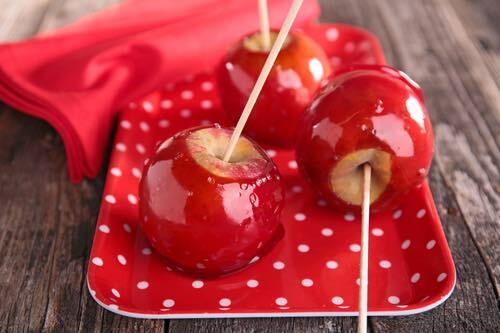 These homemade candy apple recipes can also be used on other special occasions. For instance, why not serve red and green candy apples at Christmas time as a special treat? And just imagine giving red candy apples for an edible gift on St. Valentines Day, or how about pastel pink, blue, or green ones at Easter? Be creative and enjoy making your own candy apples on a stick this Halloween. Kids of all ages love to eat them anytime!